An Egyptian appeals court on Saturday revoked harsh 11-year jail sentences handed down in November to 14 girls and women for staging a protest in Alexandria demanding the reinstatement of toppled President Mohamed Morsi. The 14 defendants were given suspended sentences of one year in prison each after the earlier verdicts provoked a public outcry and drew fierce criticism from local and international rights groups. Seven minors — aged 15 and 16 — who had also taken part in the Alexandria 31 October protest were acquitted by the court but are to remain on probation for the next three months.The young defendants who were released on Saturday after a month in custody, had previously been ordered detained in a juvenile centre until they turned 18 . The girls are members of the so-called “7am movement” that had recurrently held early morning “anti coup” protests outside a school in the Mediterranean port city. All 21 defendants had been charged with ” thuggery, vandalism , illegal assembly and use of weapons” — charges that rights groups insist were “politically motivated”. In a statement condemning the November verdicts, Amnesty International described the girls as “prisoners of conscience” and said their detention reflects the Egyptian authorities determination to punish dissent. Human Rights Watch , HRW, meanwhile said “the court had violated the right to free trial as witnesses were barred from testifying in the girls’ defence.” Little evidence was provided for the charges the girls faced”, HRW added. “Such verdicts raise doubts about the independence of the judiciary in Egypt and signal a return to the Mubarak era when the courts were often used as a political tool against the opposition,”the Cairo-based Arab Network for Human Rights Information, ANHRI, said in a statement released after the verdicts were announced by a Misdemeanour Court. In a statement issued on the Muslim Brotherhood’s official website Ikhwanweb , the Freedom and Justice Party, the political arm of the Islamist group also denounced “the unjust “verdicts sentencing the girls to long jail terms for what the FJP said were “peaceful protests”. Images of the young defendants clad in white prison garments and headscarves were widely circulated on social media networks, fuelling the anger of Egyptian activists–including many who participated in the June 30 uprising demanding that President Morsi step down. 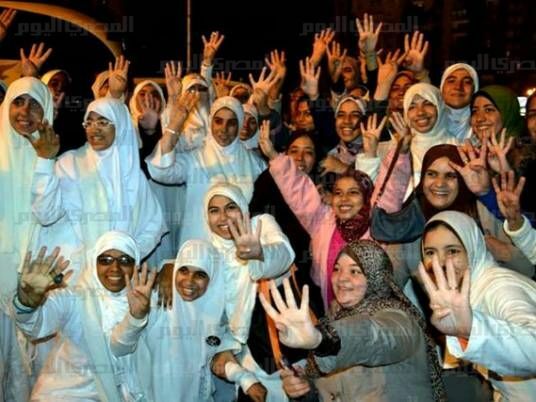 In a message posted on Twitter on 27 November (the day the verdicts were announced), blogger Zeinobia stated “Today Egypt jailed 14 girls for holding balloons at a protest!”. “The state where there is respect for rule of law welcomes you!” he sarcastically added . In recent weeks the military-backed government has widened its crackdown, detaining dozens of secular pro-democracy activists who have helped the military consolidate its power by participating in the June 30 uprising against the previous Islamist government. Prominent political activists Alaa Abdel Fattah, Ahmed Maher and Ahmed Douma were among protesters detained two weeks ago for violating a new law regulating protests. They face investigations and have been referred to military courts on charges of allegedly “inciting protests, thuggery and resisting security forces”. The excessive use of force by security forces in dispersing the recent protests and the harsh verdicts for the Alexandria girls signal a return of rights violations reminiscent of the Mubarak era, serving as a warning message that the authorities will stop at nothing to silence dissent.